A hearty country Italian chicken stew recipe with white beans and red potatoes. Fall has finally settled in and I've been craving soups and stews. I had a beautiful chicken sitting in the fridge that I’d planned on making soup with when I got to thinking… how come you couldn't make a chicken soup more like vegetable beef soup with lots of vegetables? Me: I’m going to make vegetable beef soup with chicken. Me: Um, that sounds kinda weird. Me: No, it doesn't. It’ll be glorious! Me: It’ll be weird. If you’re going to do something like that you need to change it up a little. Me: Like, maybe instead of traditional country vegetables (corn, okra, green beans, etc.) you go another route? Me: Yes!! Go for something rustic and a tad Tuscan and use white beans and red potatoes! Me: Why white beans and red potatoes?? Me: Because we have those. In the pantry. Like, right now. Me: You’re lazy and don’t want to go to the store. Me: I’m not lazy!! I just got back from the store and don’t want to turn around and go right back. Also? I've already put my pink polka dotted fleece pajama pants on and I’m not taking them off. Me: Yeah, like I said, lay zee. But, OK, I’m liking where you’re going with this. I’m thinking lots of garlic and some Italian seasoning. So, a few hours later, the kids come walking into the kitchen asking what smells so good. I wasn't sure how they were going to take to this because my kids and stew don’t usually get along too well. I showed them and told them it was for supper. I served up a teensy bit in each of their bowls and put stuff for sandwiches on the table because I honestly didn't think they were going to embrace this. Flossy and Angel Baby took one look in their bowls and dove in. Brutus was still on the fence but since my rule is that you have to taste it, he begrudgingly put a taste of it on his spoon and touched it to his lips. Those little goats ate two bowls apiece! When supper was done, they looked like three fat little potbelly puppies that’d just been fed with their tummies all firm and round. I served this with a pan of Skillet Cornbread. We all put chunks of the cornbread in our bowls and let it just soak up all the goodness. Bring broth to a boil and add celery, carrots, onions, potatoes, beans, thyme, garlic, paprika, red pepper flakes, Italian seasoning, tomatoes and remaining 1-2 teaspoons salt (this depends on how salty your prepared chicken broth is – salt to taste) and 1/2 teaspoon pepper. Reduce heat to medium and cook, uncovered for 30 minutes (cooking this uncovered will help reduce it and enhance the flavor). Meanwhile, remove skin and bones from chicken; shred or chop chicken, cover and set aside. Once vegetables and broth have cooked for 30 minutes, add chicken and stir to combine. Cover pot, remove from heat and let stew rest for 30 minutes. Stir and serve with cornbread or crusty bread. Husband's family is down from Ontario now! I bet y'all know each other!! LOL! I hope you try it and if you do, I hope you like it! I am making this right now--however, I do not have the red potatoes and will have to use my Idaho spuds. :) I hope it turns out well! That'll work fine!! Don't forget to let it rest before you eat it. You can say goodbye to the roof of your mouth if you don't but also, it's so much better when it's not scorching hot and has has a chance to get happy. Let me know if you like it! So glad you're making it!! I made this recipe last night and it was absolutely amazing! Thank you for sharing such a great recipe. I look forward making more! Again thank you! This looks delicious! Found you over at Weekend Potluck! Thanks for bringing this amazing stew to Weekend Potluck! You have been selected as one of the featured recipes today!!!!!!! YAY! Feel free to come on over and grab a red I was featured button from my sidebar. I made this Christmas Eve for my family....what a delicious stew (I call it soupa)!! Everyone loved it, I will certainly make this again and one that will be a favorite meal at our gatherings. (BTW..I did not use the red pepper flakes..nor all the garlic..I used two cloves, and added a second can of northern beans to the pot..mmmm, mmmmm, good..) The chicken was sooooo moist..I made the chicken in the broth about 5 days before and froze the chopped chicken along with about 1/2 cup of broth in a freezer bag...froze the broth seperate. You won't believe how moist the chicken will be by adding the broth when freezing. Thank you for an awesome recipe..even if we tweak it to our own tastes at times. Forgot to add...I thawed the broth and chicken the day of serving, then added all the veggies and seasonings per recipe. This worked out well, as I didn't spend time cooking or cutting up chicken all in the same day along with the veggies. Tweak away! That's what I do! I'm glad you and yours enjoyed it! This stew looks really good. I absolutely love soups and stews so I will definitely try this one out. Thanks for sharing! I just pinned this recipe to make sometime soon. Would love for you to join our Foodie Friends Friday linky party this week. We always have sponsored giveaways to join also! Come on over to my blog and link up a recipe or two! Ok I love the soup, but I need an Non-alcoholic marqaritas punch recipe for a wedding. I need it now and I have been looking all over for it. When I do my seach it takes me all over. Please help. Fabulous recipe! My mom made it Christmas Eve and I've been craving it ever since. Just finished making a pot for my family for dinner tonight. A keeper recipe! I was planning to make chicken pot pie for dinner. but I think I'll make this instead! Thinking I'll add mushrooms for even more veggies. I'm out of potatoes, so we'll see how this turns out. And I just liked you on FB. Thanks! I just happened upon this site via Pinterest. This soup sounds awesome. I can't wait to try it. How much chicken would I need if I were to use chicken breasts instead? Surely not the same 5-6lbs? Can't wait to make this, all the perfect flavors. Friends coming this weekend, lucky them! Been wanting to make this since you first posted and I finally did. Delicious & the whole family loved it! I used 4 split breasts because they were on sale (3 was plenty - using the extra one for chicken salad). I think next time I'll add a little parmesan. I don't know which I enjoy more, your recipes or your sense of humor. So refreshing to find a foodie blogger sans wooden spoon up the posterior! Hi! I'm making this tomorrow and wanted to know how many your recipe serves? I'm so excited to make this, thank you for sharing! Yummo. I am making it now. This sounds delightful! I'm whipping it up right now but wondered how I might use my crock pot? Any suggestions how how I might need to change it up? Any concerns? Would this be okay without the tomatoes? I would love to make it but my fiance hates tomatoes. Sounds great. I love the internal dialog. Glad I am not the only one that does that. I think the Lord would bless me if I threw away my bacon grease! I don't know what those beans are. What else can I use if I can't get them where I live? If you've got no potatoes couldn't you use rice? But it does sound lish. Not yet though. Steaming hot here. Roll on winter. sounds fabulous. I am zipping and trying later. one comment, though. not truly southern if you add flour to your cornbread, although the authentic bacon grease almost brings you back. I just do poor people cornbread - 2 c. white self rising cornmeal, 1 egg, enough buttermilk or sweet milk and pour into preheated pan with melted bacon grease. LOLOLOL. This recipe and all the ones off to the side look amazing!! I came across your blog yesterday, thanks to Pinterest! I made this stew last night for dinner and all I can say is... it was SO very delicious! My husband took one bite, and mumbled..."Man this is so freakin' good", then proceeded to down the whole bowl! It's a winner I think :) We live in Ireland, and it's already getting COLD so it was the perfect stew to warm us up. Thanks a million for sharing! You're a superstar! I totally cheated and used 2 cans of chicken, a can of cream of mushroom soup and a can of mixed veggies instead of all fresh...I know, I know!! Sorry... But it was delightful just the same and SUPER fast, just threw it all in the crockpot and the family loved it! I did use fresh tomatoes tho and next time will follow the recipe! I made as directed except left out the thyme. Delicious!!! I am so glad I found you!! We are in St. Simons Island, GA right now for the month and I will try this recipe once we get home. I can't believe how alike we are!! I love your warped sense of humor. A lot of people just don't get it. Tomorrow is a Shrimp and Grits Festival on Jekyl Island. Can't wait to dig in. Your recipe looks good and I'll try that also once we get back North. I LOVE the south. When my parents came to the US in the early fifties (legally) we should have settled in the South, although then I wouldn't have met my wonderful husband. Keep up the great blog. This recipe is ABSOLUTELY DELISH!!! Now I am not a big soup person, but this was OUTSTANDING. It is so aromatic and hearty, just fabulous. My 9-year-old devoured the leftovers and said it was the most delicious soup/stew she'd ever had (she was skeptical at first)! I will definitely keep this one an will be making it again VERY SOON. Perfect fall/winter (or anytime) recipe. Thank you! Can't wait to try this one. I make a meatless Tuscan Soup that is delicious but now I'm ready for another ...THANKS! I'm gonna be making this tonight for my mother and myself. It'll be just the 2 of us, how many does it serve?? This was so unbelievably good. My daughter was hesitant to try it, but as soon as I told her this came from the lady that did the cheese biscuit recipe, she dove right in!! Even my fussy husband ate it. We had your chocolate pie for dessert as well, it was the perfect end to supper. Thank you for making a great meal!! WOW I made this tonight and my family LOVED it!!! I Substituted sweet potatoes for the red potatoes and corn for the white beans. I also added my homemade cream of something soup to thicken since I didn't use the beans and it was delicious!!!! Def gonna make again!!! Hey Girl: I made this over the weekend and let me just say. Next time I will have to double it. Russ and I ate it in one sitting. I did not have any potatoes so I had to use a can of diced potatoes...not as good but it worked. This is on the "make it again" list! Thanks so much! That's about the best thing I've heard all day!! Glad you and Russ enjoyed it! This is what we had for supper too! So glad you have a "must taste" rule in your house. When my children were small we called it a no thank you helping. after they tasted they said No thank you or Yes please more. Used chicken breasts and it is very good- I bet it is even better using a whole chicken. Love the combination of red pepper flakes, paprika, thyme and Italian seasoning. Next time, however, I will use way less black pepper as I find that component overwhelming. I took French bread, topped it with garlic butter, parmesan and a drizzle of olive oil and cooked it at 425 for about 15 minutes and had that with the soup- perfect! I love your site. I get so many good recipes from it. They are so good that my family likes me to make them over and over again. Keep sending us these great recipes, I really look forward to getting them. I HAVE A RULE, WHEN MAKING A RECIPE THE FIRST TIME ,ALWAYS, FOLLOW THE RECIPE WITHOUT DEVIATION. GLAD I DID , THIS RECIPE IS ONE OF THE BEST SINCE WE LIVED IN ITALY. Just got done with dinner!! This was FABULOUS!!! Thank you so much, we will certainly be making this again and again! I'm def making this but wondering why the Onions came walking into the kitchen and Flossy Angel Baby & Brutus sound like you are serving this to your pets! Thx for sharing, Love your Style!! LOVE this recipe. Have already made it a couple of times this fall, and plan many more. I had extra zucchini and eggplant, and they were excellent in the soup also. I just had my first bowlful. Worth all the work! I used homemade chicken broth, so it already had a lot of the flavors I like. And "fresh" tomatoes are awful right now, so I used a small can of Italian plum tomatoes--sliced the tomatoes and added the juice to the pot. This is delicious. Thank you! I just made my fourth batch of this delicious stew. I don't like beans so I use a cup of red lentils instead. Thank you for creating and sharing this wonderful recipe. 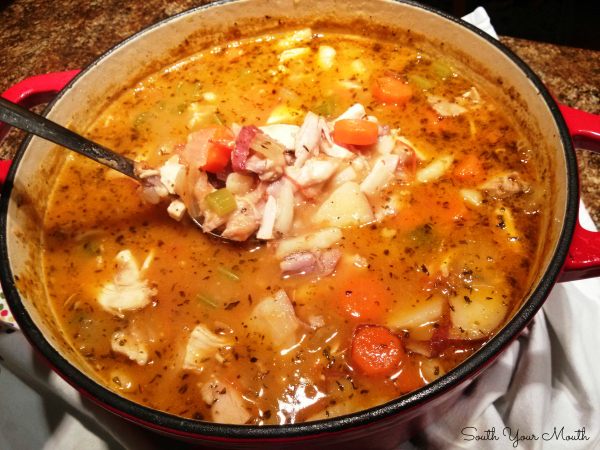 Mandy, I have been making this soup for way over a year now and I have to say it is one of my absolute favorite soups of all time! My whole family and extended family LOVES this soup. I was thinking of making a soup tomorrow and checked my list of favorite soups, this one of my other absolute favorite (Sausage and Bean Soup with Pasta - from The Italian Dish), and this one won out! Thanks again for posting it. Hi! Do you have the nutrition facts for this recipe? Specifically, I need to know serving size, Calories, Carbs, Protien, and Fats. Thanks!! I'm about to make this a second time for some company tomorrow night. It is absolutely delicious!! The first time I made it we had some in-laws over. My nephews aren't fans of meat and don't like things too spicy so I left out the pepper flakes initially. Once I cooked all the veggies I ladled out a portion for them, then added the chicken back in and the red pepper. Everyone loved it. I served it with some buttermilk biscuits. I think tomorrow I'll put out some homemade bread. Tomorrow night one of our guests is vegetarian, so I'll set some aside before adding the chicken back (I know everything is cooked in the chicken broth, but I don't think they'll mind, they aren't super strict vegetarian). Also, I'm starting my prep on it now, boiling and shredding the chicken and chopping the veggies. Then tomorrow all I'll have to do is throw everything together. Hooray! This stuff is seriously good. I was just flicking through my emails, and there, in the condenaste.com one was the recipe for this stew. As soon as I saw it was one of yours, I HAD to pin in! Even though I haven't made this yet (as white beans are not something my wee Arctic stores carry), it looks absolutely amazing and I can't wait until our next trip south to Edmonton Alberta to get these beans! Oh my goodness! You have no idea how much I needed a bit of kindness today! Thank you so much for taking the time to write. You two keep warm and keep cooking! Making this again tomorrow ... soooo yummy! As a former blogger, I love this post! It is exactly what happens in my brain every day! Thank you for a great read and a great recipe! I just made this after seeing the recipe on FB. It is so delicious. The only change I made was that I sautéed the veggies for a few minutes and then added the broth. I think next time I will leave out the red pepper flakes because it was a little spicy for the kids. I made this for dinner tonight and my family loved it..said it was a keeper. Thank you for sharing. 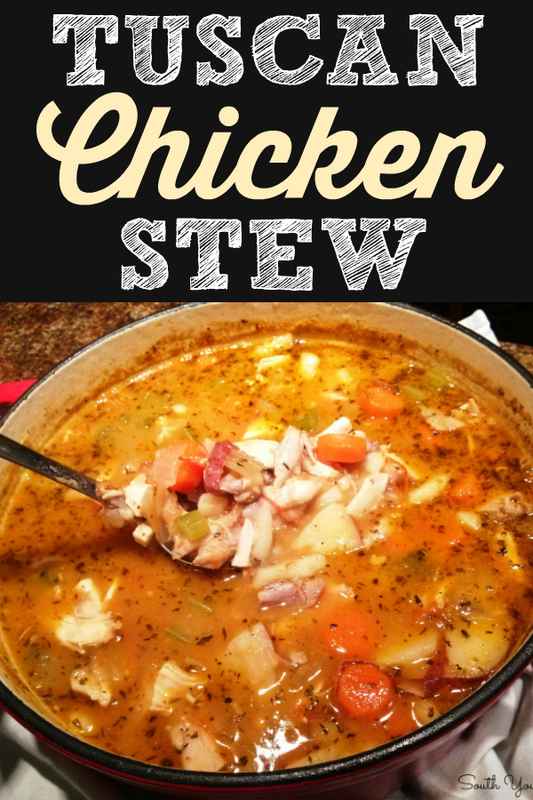 This is my husband's favorite chicken stew. If I have this simmering on the stove when he gets in from a hard days work.....all the stresses of the day just melt away. He's on his way home from Phoenix at the moment and I am going to surprise him with a nice hot pot of this, along with some crusty rolls, Irish butter and a salad. Mmmmmmm!!! I made this exactly as written! Delicious! Thanks for a great recipe! This recipe caught my eye in your book, South Your Mouth, and I can't wait to try it. However, I came to your website because the recipe directions in the book mention tomatoes, yet the ingredient list did not have them listed. Luckily they're here on the site and the mystery is solved! Made this for dinner tonight (9/23/2018) and incredible doesn't do it justice! My wife and I loved this dish. I doubled the beans and spices (except for the garlic) because I'd rather something be over-seasoned so I can tone it down later. It was perfect for our palate with the double spices. Great recipe - thanks, Mandy! Made this stew last night, we all loved the stew. will definitely make this again. Super easy to make. I purchased a roasted chicken from the store and I used a can of tomatoes. Mom likes her soups or stews to be juicy. I have been making this for over 2 years now and it's absolutely my fav to cook. I double all the ingredients except the chicken thighs, I only use half the amount. I boil the chicken for 30 minutes then throw everything in and cook for another 40-45 minutes. Let it sit while baking fresh challah bread, turns out delicious!